"A pumpkin loaf spiced with cinnamon, ground cloves, and nutmeg. I came up with this recipe after many failed attempts at pumpkin loaf. I adapted a favorite banana loaf recipe and this was the result. Yum! This recipe yields 3 loaves. Stock your freezer!" Mix white sugar, brown sugar, and melted butter together in a large bowl. Stir in eggs and vanilla extract; mix in pumpkin until thoroughly combined. Whisk flour, cinnamon, baking powder, baking soda, nutmeg, cloves, and salt together in a separate bowl. Mix flour mixture into pumpkin mixture until incorporated. Pour batter into three 5x9-inch loaf pans. Smooth batter evenly in each pan. Bake in the preheated oven until a toothpick inserted in the middle of each loaf comes out clean, 45 to 50 minutes. 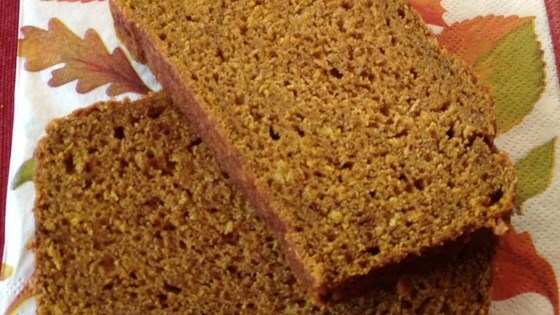 See how to make a simple pumpkin bread that’s always moist and delicious. If you desire, you can combine 1 tablespoon white sugar and 1 teaspoon ground cinnamon to sprinkle on top of the loaves before baking. Moist and rich but could have been a bit sweeter and needs more spices. I also used ginger which is not included in the original recipe. Delicious Pumpkin bread! I will definitely make it again. Made for my wife (she loves pumpkin bread) and she won't let me make a different recipe. Tasted like pumpkin with a few spices that didn't overwhelm the overall taste. Thumbs up for Jim.